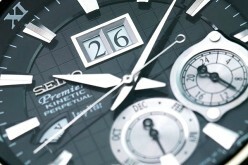 TX watches, launched in 2006, is a high-end watch company owned by the Timex Group. During Baselworld 2009 I had a chance to meet with part of the TX team – Anita Lefebvre (Sales Director), Giorgio Galli (Designer) and Scott Wolfe (President). 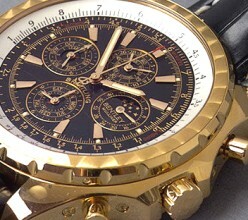 After speaking with them, one thing was clear, they intend on making some of the very best watches in their niche. A striking blend of style and substance, the marriage of movement and mode, TX Time Instruments represent the unification of precise instrumentation and pure aesthetic form. The modern consumers desire for design and cutting edge materials fused with performance and authenticity is realized in each TX Time Instrument. The TX 650 GT Flyback chronograph is one of TX watch's new 2010 timepieces, it is just starting to hit stores in the US this month. 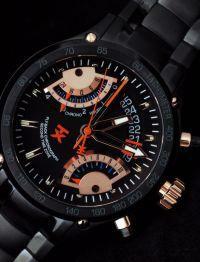 The version shown is features a PVD treated stainless steel case, with rose gold accents. The quartz movements are designed by TX, and feature 6 motors, which run the time, 2nd time zone a flyback chronograph and a date wheel. 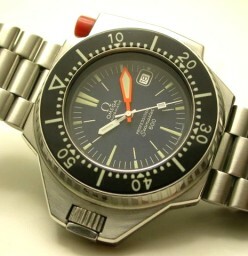 The quality to value ratio on this watch is excellent.